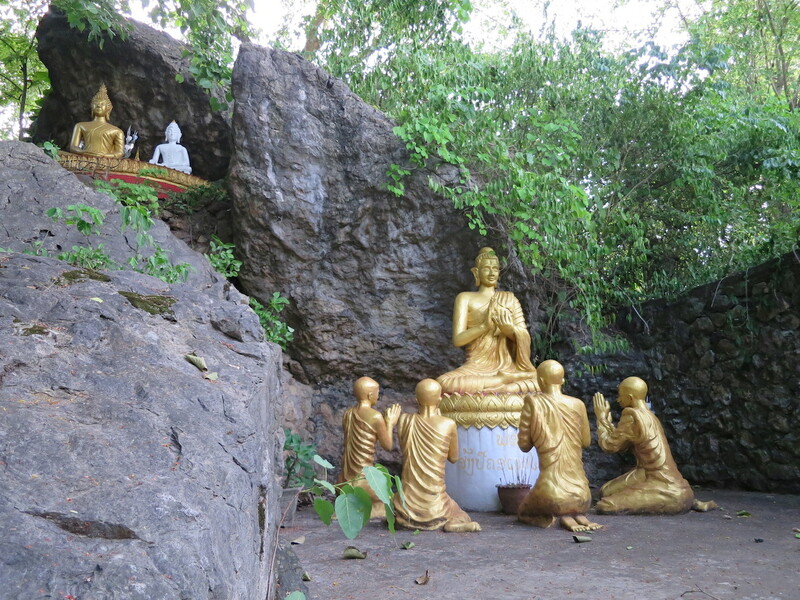 For a change from the conventional birthday celebrations, I decided to go somewhere where there is no one I know, where the people don’t speak a language I know, on my 28th birthday. It’s a trip for soul searching, priorities resetting, whatever you call it. 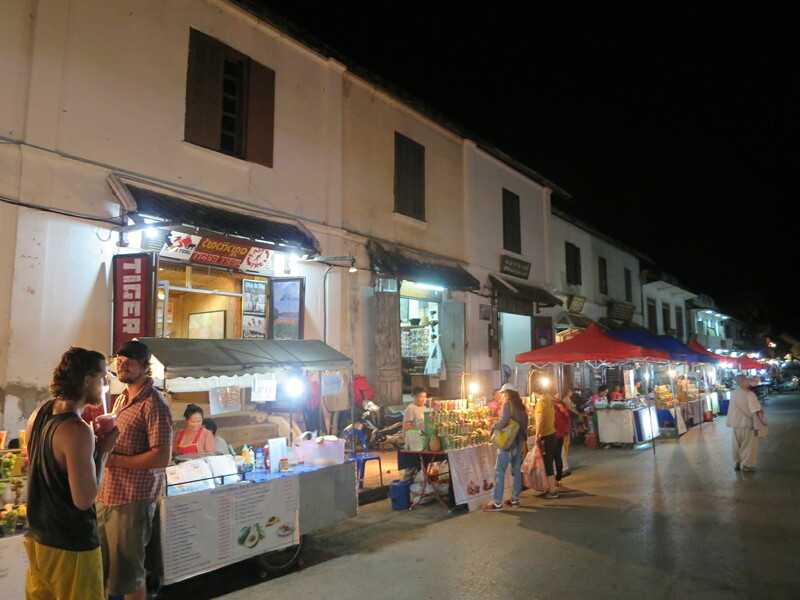 Given the limited amount of time and money I have, and having been inspired to know more about Asia and especially South East Asia to strengthen my own identity, I picked Luang Prabang in Laos, one of the few cities in the world that hasn’t been infested with Starbucks or Macdonalds, or perhaps any form of capitalism. 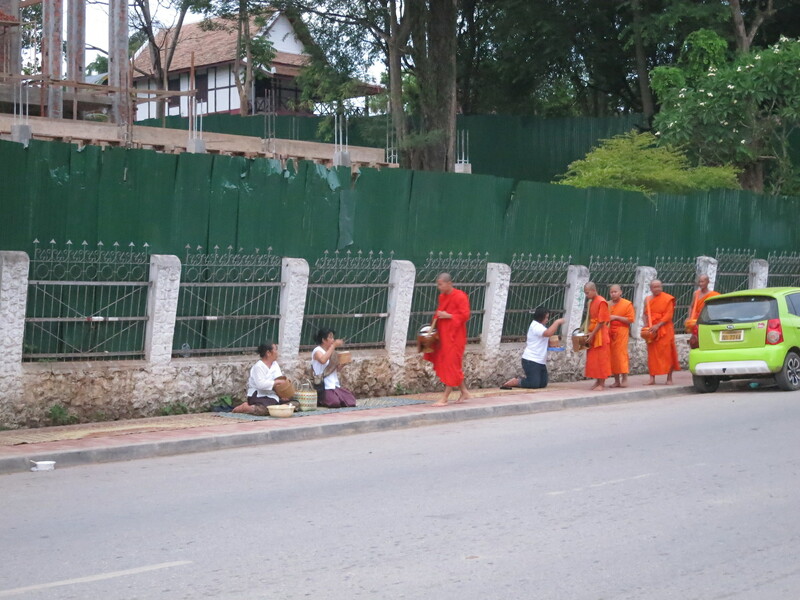 So on Friday, I took a flight from Narita Airport to Laos, via a 5-hour transit at Hanoi, before arriving at Luang Prabang International Airport in the evening. 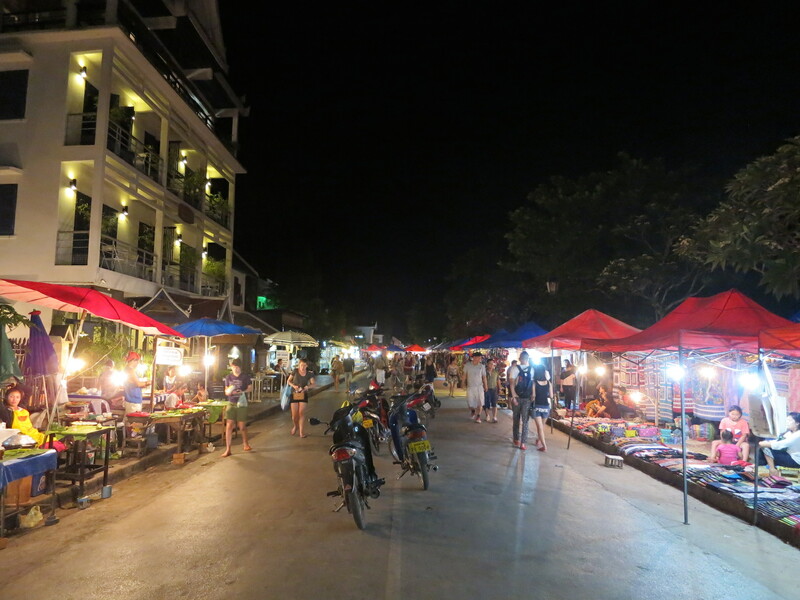 I checked in to my hostel, before leaving immediately for the night market. 金曜日に成田空港からハノイ経由でラオスへ向かった。そして夕方にルアンパバーン国際空港に到着した。ホステルにチェックインしてからすぐナイトマーケットに出かけた。 Stalls line up along the streets of the night market, selling a range of items from clothes, lamps, silk to food and drinks. 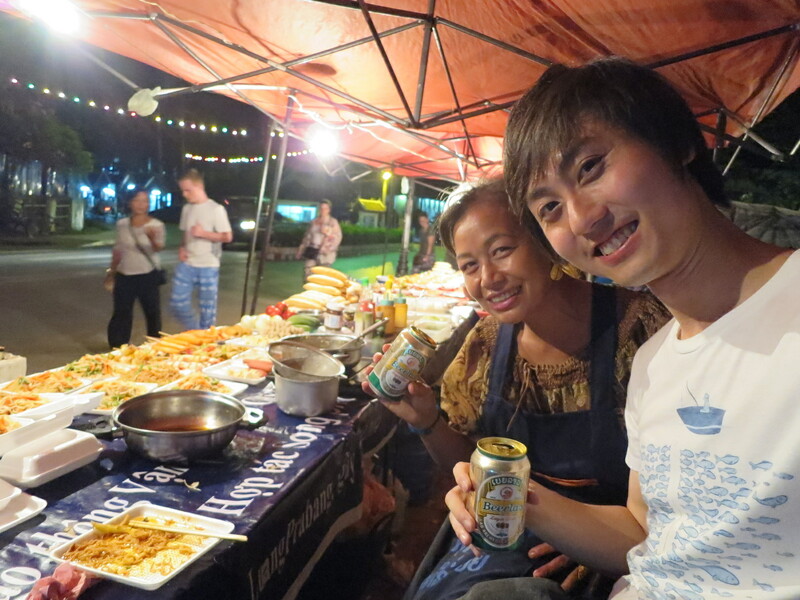 I approached one of the food stalls and ordered a plate of fried noodles. 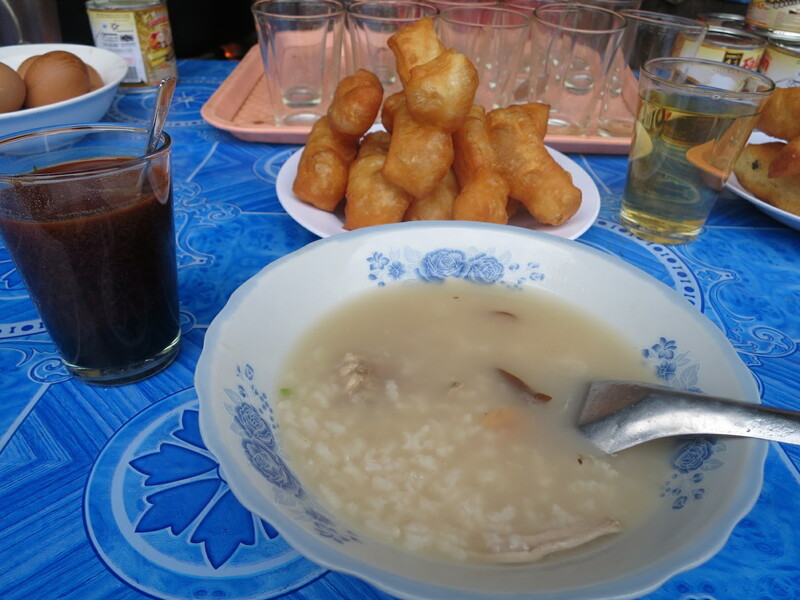 The only table at the stall was taken up so the lady instructed me to sit beside her to eat as she prepared the dishes. It was funny how I ended up sitting next to her at the stall and it must have appeared to the passers-by that I was working there. Then we started chatting. 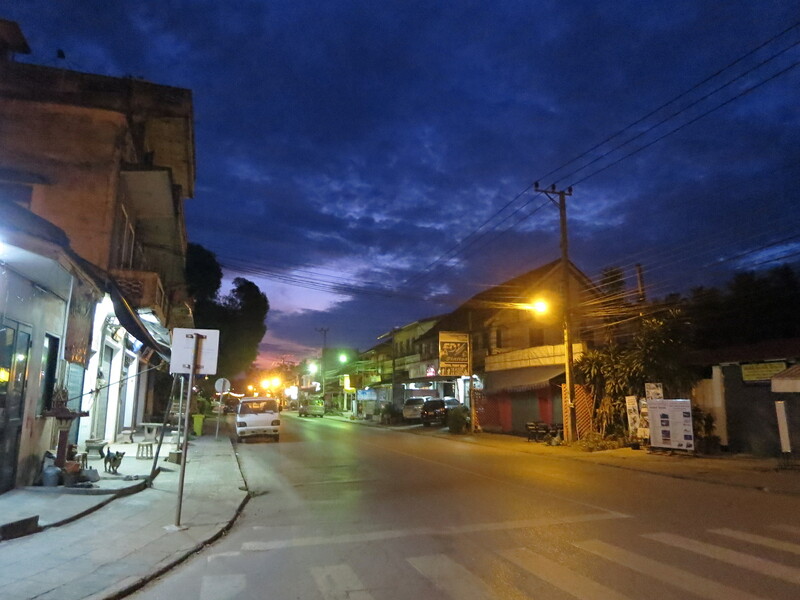 We started introducing ourselves, and talked about my stay in Luang Prabang, my plans and so on. 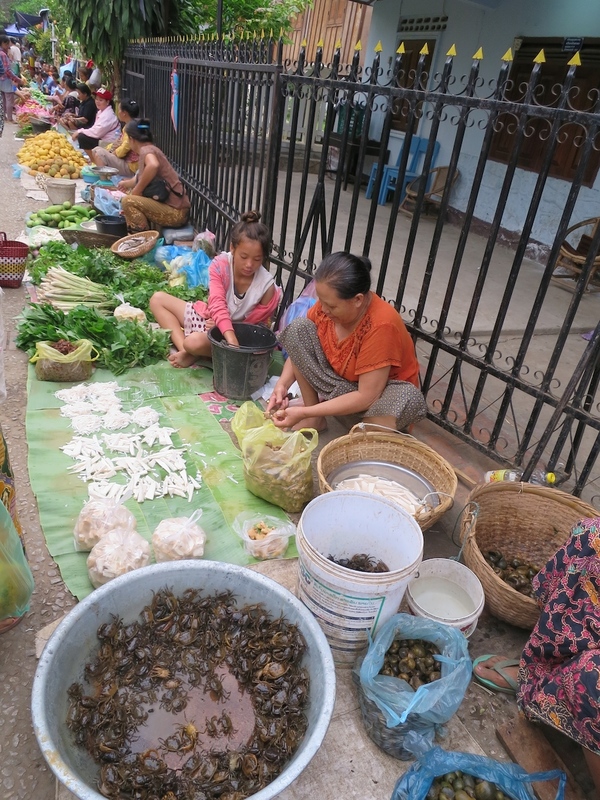 When customers dropped by the stall, she would ask me to help sell the food. Three german girls came by and bought some food, and sat down at the table that was now available. She then told me to serve the dishes to them. I ended up working a little at the stall, but that was one of the greatest sensations, knowing that we have built a little trust relationship and I felt I was being accepted into the society for the first time. Incidentally, the lady could barely speak English, so I was putting into use the Lao language I learnt a few days before departing, and the rusty Thai language I learnt 5 years ago. Needless to say, I could only understand less than 10% of our simple conversation, but it never felt better chit chatting with a local in the local language. 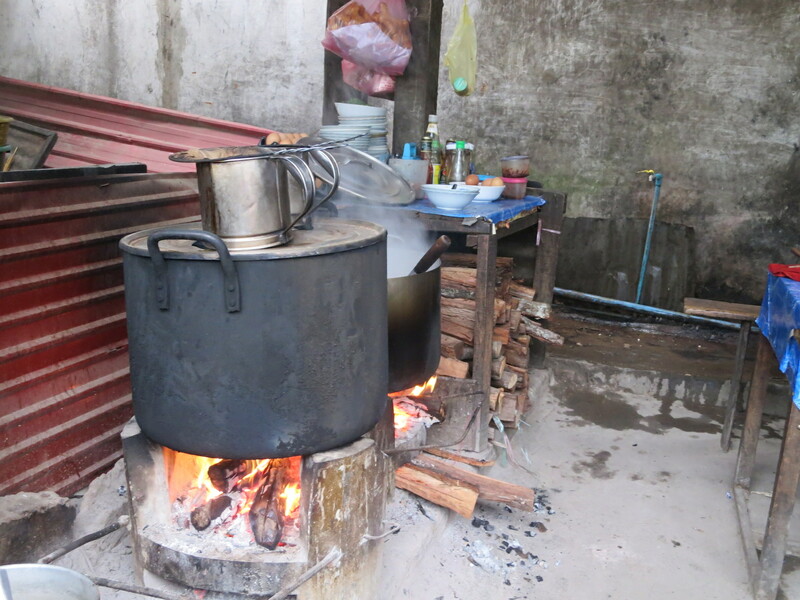 Early next morning, I went to observe the alms giving ceremony at 5:30am, before having breakfast at one of the local stalls, where they prepared warm porridge, heated using charcoal. 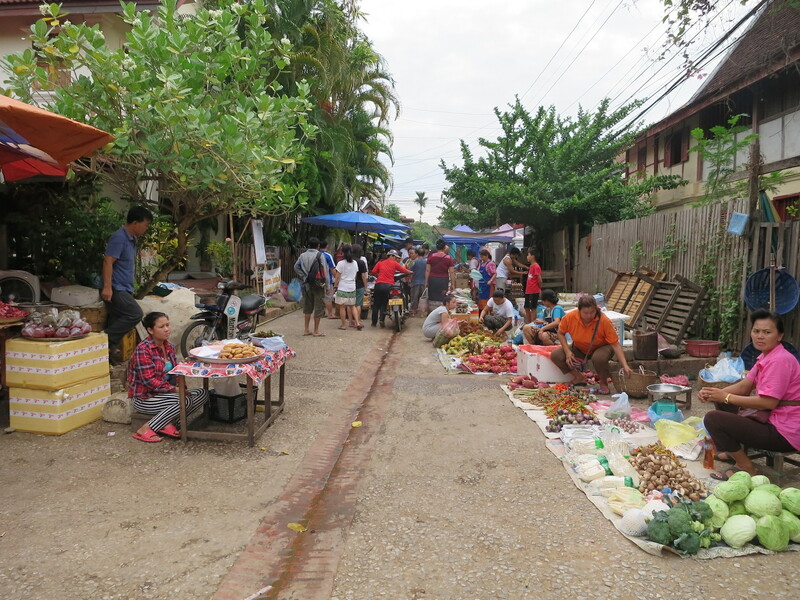 I then made a trip to the morning markets in the back alley, which was a pretty long stretch of Lao women and men selling a wide range of fruits, vegetables, meat and even weird insects! 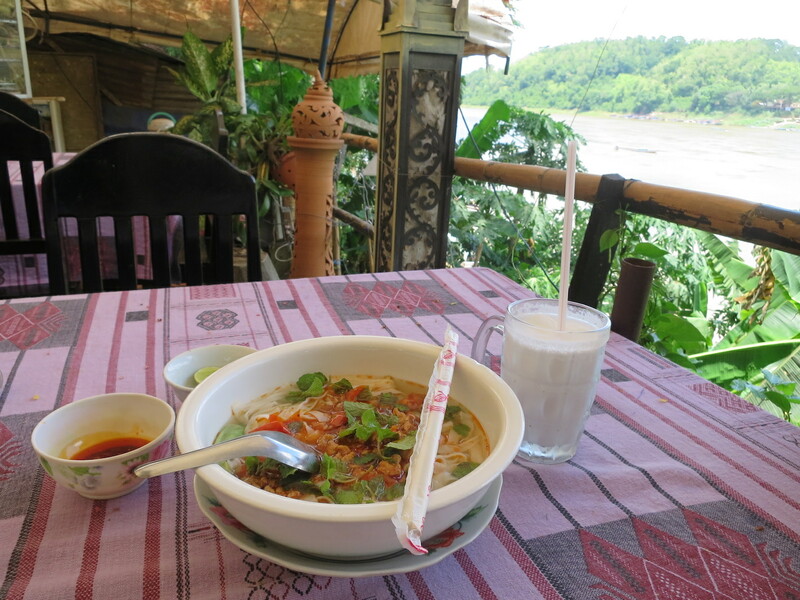 For lunch, I had Kau Soi (a type of local noodles that was quite delicious!) 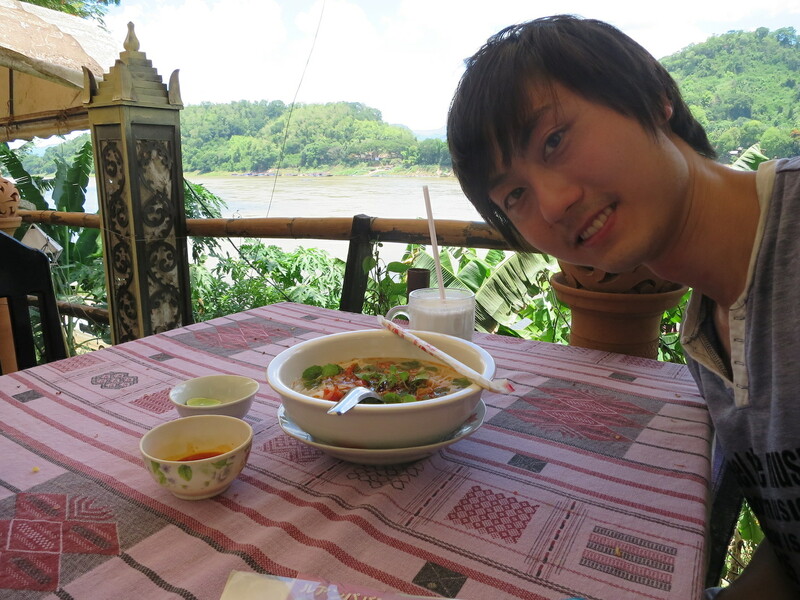 along Mekong River. In the afternoon, I visited Ock Pop Tok (meaning East meets West), a British-Lao company that makes and sells traditional Lao crafts. 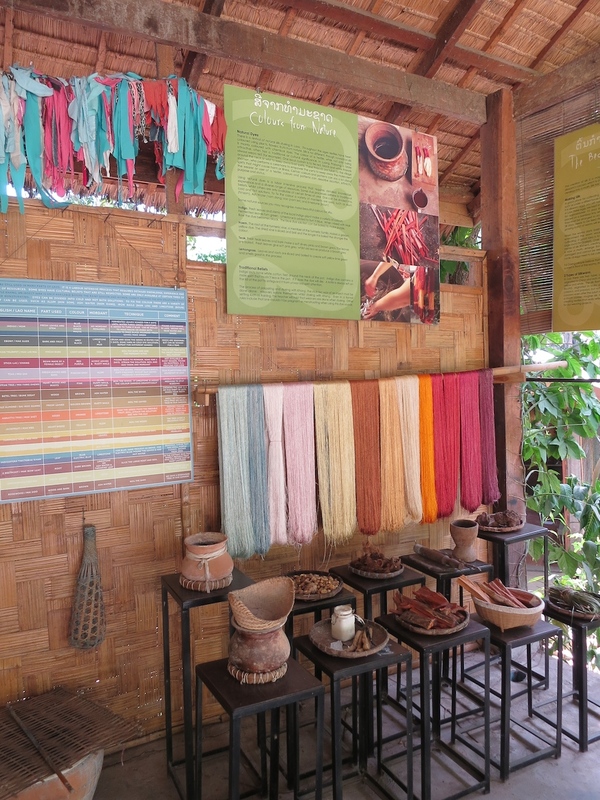 They employ both locals in Luang Prabang, as well as people, including the ethnic minorities, all over the country as their weavers. I met two of them in Tokyo a couple of weeks ago, and I decided to pay them a visit this time. 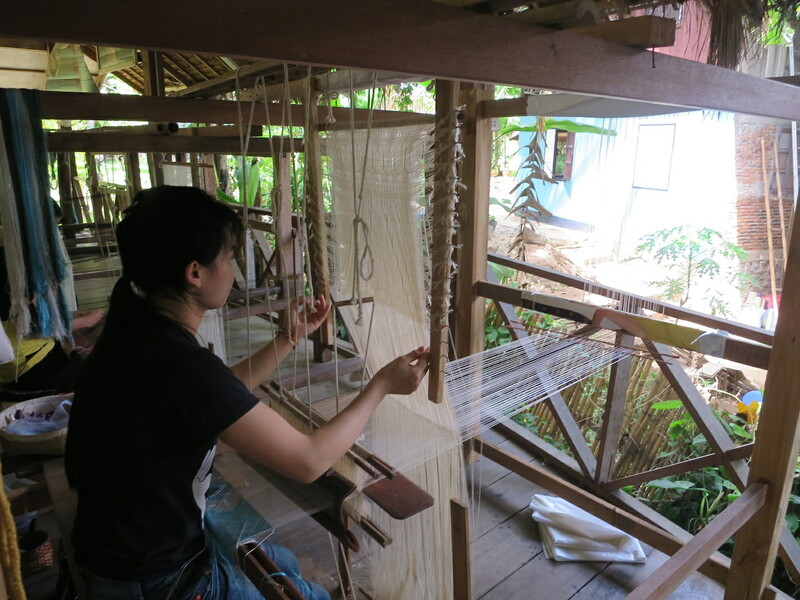 It was extremely interesting to learn about their products and watch the weavers at work. 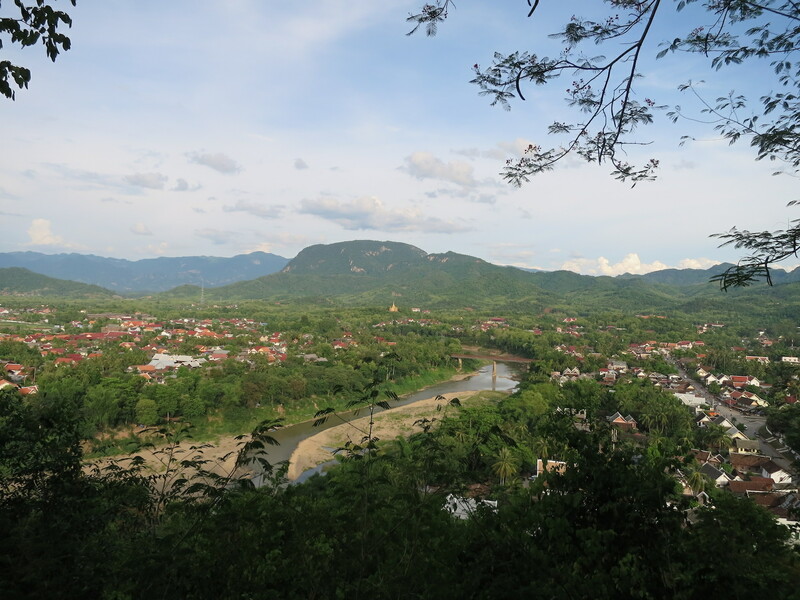 In the evening, I climbed up Phousi Hill, the famous hill in Luang Prabang that overlooks the entire city. It was a pretty easy climb with steps. As usual, there were many tourists up there. I sat down on the steps, eavesdropping on the conversations around me, as I tried guessing their countries. There were people from United States, UK, Japan, Korea, China, Thailand, Paraguay, Switzerland, Germany, France, New Zealand and so on. 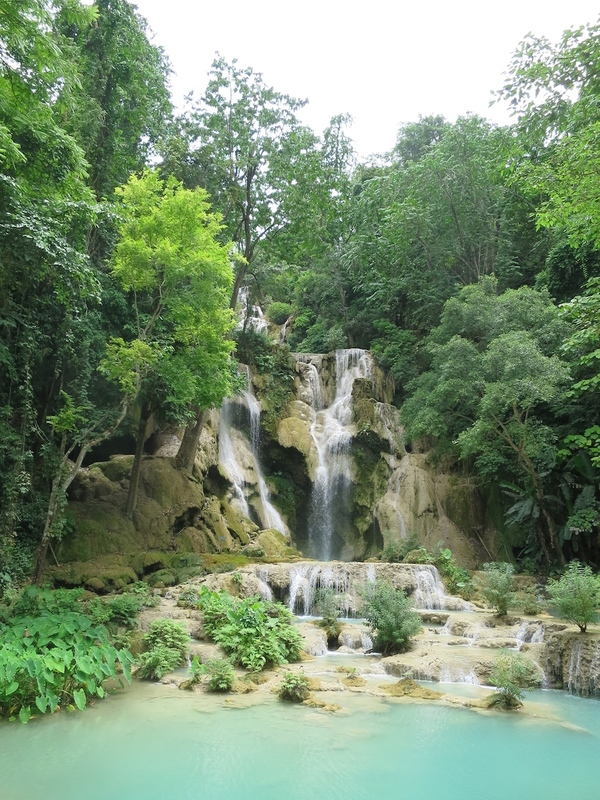 The next day, on my birthday, I made a trip to the famous Kuang Si Waterfall. 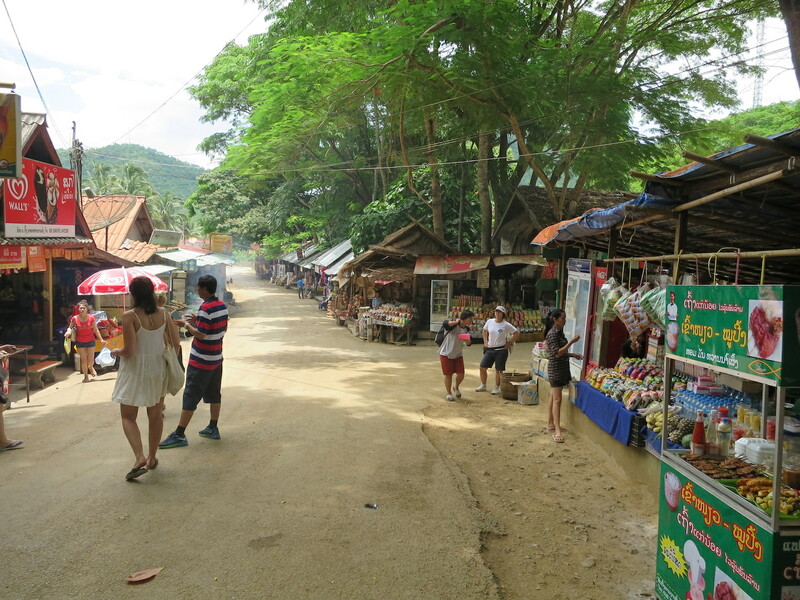 On the mini-van trip, there were several other tourists who had been/ would be traveling around South East Asia for several weeks and months, some even planning for several years! As usual, we started introducing ourselves and getting in random chats. There were a British girl, a German couple, a French guy and girl, a Quebecois guy, a Swedish guy and several others. The road to the waterfall was bumpy and some of us got a little carsick by the time we reached. The waters at the waterfall were emerald green and absolutely beautiful. There were many children and adults swimming, jumping off trees into the ponds and playing around. 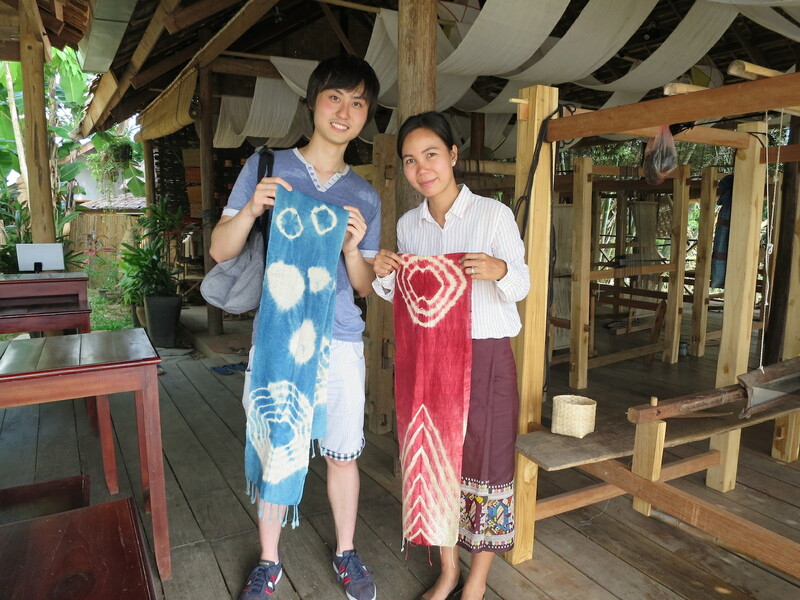 After the waterfall, I visited the Traditional Arts and Ethnology Center where I learnt a great deal about the ethnic minorities and their traditions. I went back to the hostel to take a break, as I chatted with the two staff at the hostel. The guy is actually of Hmong ethnicity and he taught me a thing or two about his native language and culture. 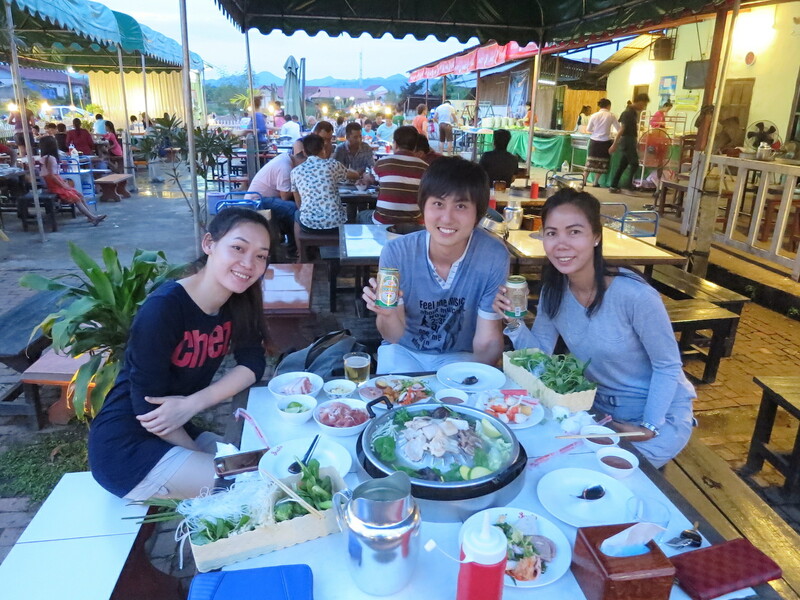 At night, my friend treated me to barbeque for my birthday dinner, to round off this amazing trip. 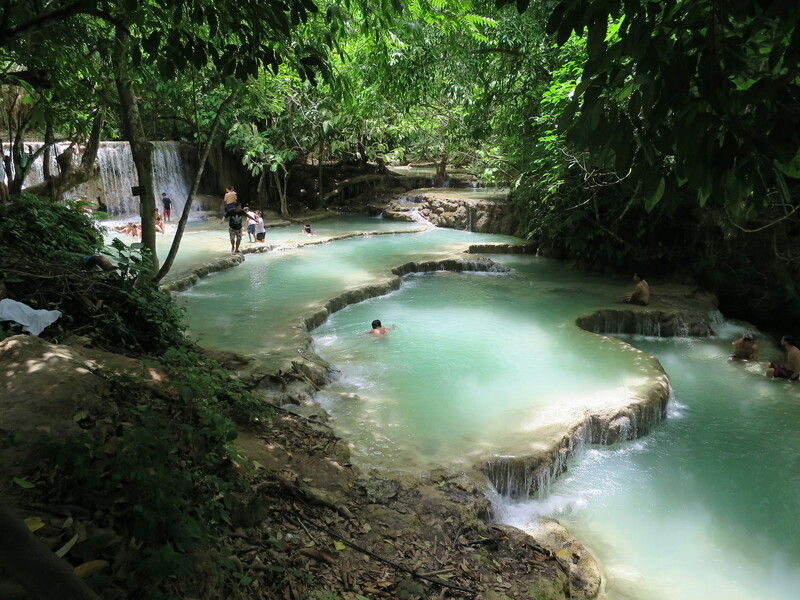 Luang Prabang is definitely one of my favourite places on Earth now. Amazing people, amazing scenery and amazing cultures!